Choosing paint colors that coordinate with your couch, helps bring the color scheme of your room together. This is a guide about choosing paint colors to coordinate with a blue/gray couch. I have a dark blue/gray couch and love seat, with a black TV stand and coffee table. 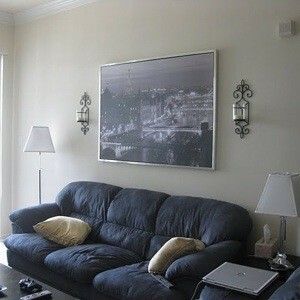 I am looking to paint my walls, but I want to put up some black and white photos, too. I have an off white wall now and it seems to be too boring. What color wall would look great? I heard brown or beige would be good. Any ideas? How about a blue grey color or the tan and maybe add some bright floral or striped pillows? A multicolored rug on the floor would add some color too. I might paint the silver frame & sconces white also to go with the crown molding. Good luck. I think a medium to deep tan would really make the black accents in the room pop. Definitely gray. Especially since you have some gray in your couch. A medium gray I would think. Too dark and it would fight with the couch. You can get paint samples even and try out a couple of shades. Good luck! Most times you see b&w photos they are on white walls like NY loft type decor, but I do like mauve or brown behind b&w. Love your crown molding. May I suggest leaving your walls white in a flat paint, then paint 6" stripes using semi gloss. Makes the walls look rich. You might also try painting your lamp shades, make them pop. That's a great picture. I think it should stand alone. I need to know what color goes best with a blue/gray couch. I need wall colors. Thank you. It depends on the quality of the light in this room. If it gets a lot of sun the blue will pull forward more in the room. Some people like a complimentary color scheme. So based on that theory, perhaps a tint (think the color mixed with white) of orange/salmon. Blush may be pretty. If you want something that is less bold you may prefer an analogous color - a color on either side of it on the color wheel. So think ocean combo - greens and violet. Then also there is a possibility of a split complementary color combination. If the complement of blue gray is orange, then the split takes a color on either side of that color. This means some shades of red and yellow could be very dynamic. I don't know if you like any of these color family suggestions. There is not best color that could be advised without seeing the couch color in the room with natural lighting. You will need to choose what colors resonate with your tastes. Have fun pulling paint samples and enjoying this process. Blue-gray is one of the earthtone colors, so the other earthtones all blend well with it. Avoid that 80's hunter green, a lot of black, hot pink or lemon yellow. The general rule is to use two colors that are close together, and a third color quite different as the accent color. So how about blue-gray with cream and tan, and then rust red for the accent? Or blue-gray with moss gray-green shades, and brown accents?